It's been so long since I posted last and I apologize. One friend wrote that when there are no updates, he feels like we've moved away. That couldn't be further from the truth. We're still here. There's so much empty space to fill between the last blog that it may take some time to catch up. 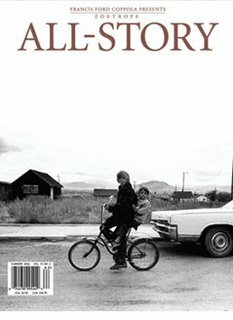 However, the big news around here today is that my work is being published, cover-to-cover, in the next issue of ZOETROPE: ALL-STORY. For those of you who don't know about it, it's a quarterly literary publication founded in 1997 by Francis Ford Coppola to (as the website describes) "explore the intersection of story and art, fiction and film. I just got proofs for Suicide Hill in, and will send to you. They look great (surprise, surprise). What I'm really writing to you about is an interesting opportunity that's landed in my lap. At first I didn't think I had time for it, but then I thought of you, and then it all at once seemed possible, but only if you're up for it. Francis Ford Coppola produces a literary magazine called ZOETROPE ALL-STORY, which you may have heard of. For several years now, they have selected a 'guest designer' for each issue, featuring some of the people listed below. They'd like me to do the Fall issue, offering their support staff to do the grunt work. I think using a portfolio of your work through-out the issue (including covers) would be perfect and amazing. Of course the down side is they have no money. You'd be credited throughout (with a bio) and it's pretty well produced and distributed. You wouldn't have to do any new artwork unless you wanted to. I would just need access to what you've done already. I haven't said yes yet and don't know who the contributors are. But I think it would be their best issue ever (visually, anyway) and could help you in securing a book deal (to use a promotion piece, etc). Please think about this and let me know asap. If you're keen, I'd like to get a disc of as much of your work as you can send me, lo-res is okay (about 200 dpi each). Of course, I agreed to it and immediately sent a CD full of images to Chip. Tomorrow, a proof of the issue will arrive. I'm so excited I can hardly stand it. The next step will be for me to upload high resolution versions of every image that Chip used to the publisher. Finally, check out a recent article about my work in access+Engage, an e-journal from mnartists.org. It was fabulously written by Susannah Schouweiler. I worked with Susannah last year when my work appeared in (the now defunct) Ruminator magazine. It was so cool to run across the James Ellroy at Border's last year with OUR photo on the cover. That's the second photo I've bought which has ended up on the cover of a book. I love some of your recent work. Congrats on the Zoetrope.